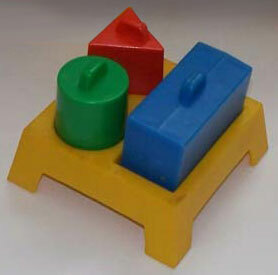 Description: Short blue square luggage rack with 4 short legs (on each corner). The top of the luggage rack has 3 different shaped "holes" (rectangle, triangle, round) to hold the accessory luggage pieces. Description: Short green square luggage rack with 4 short legs (on each corner). The top of the luggage rack has 3 different shaped "holes" (rectangle, triangle, round) to hold the accessory luggage pieces. Description: Short red square luggage rack with 4 short legs (on each corner). The top of the luggage rack has 3 different shaped "holes" (rectangle, triangle, round) to hold the accessory luggage pieces. Description: Short yellow square luggage rack with 4 short legs (on each corner). The top of the luggage rack has 3 different shaped "holes" (rectangle, triangle, round) to hold the accessory luggage pieces. 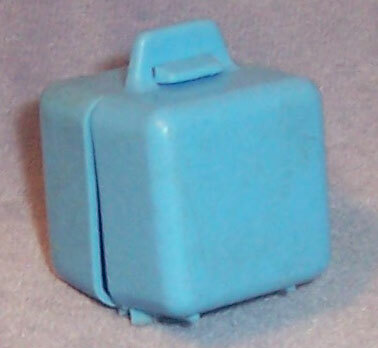 Description: Blue rectangular luggage with a molded handle on one edge (long edge). 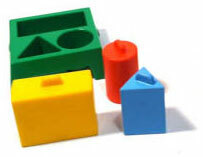 Description: Green rectangular luggage with a molded handle on one edge (long edge). Description: Red rectangular luggage with a molded handle on one edge (long edge). 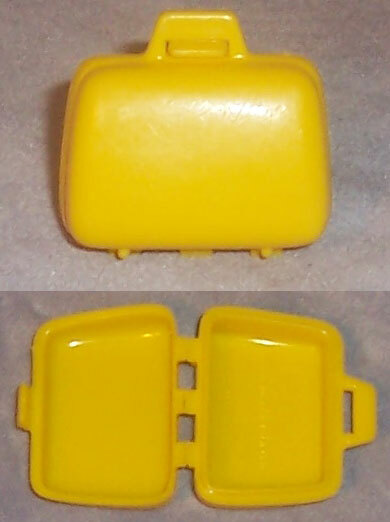 Description: Yellow rectangular luggage with a molded handle on one edge (long edge). Description: Blue wide squared suitcase with a snapping carry handle on top. The bottom edge of the suitcase has 3 hinges (often broken), and when the snap on the handle is opened, the suitcase opens. Inside the suitcase is marked, "©1973 Hasbro®, MADE IN USA". Description: Red narrow squared suitcase with a snapping carry handle on top. The bottom edge of the suitcase has 3 hinges (often broken), and when the snap on the handle is opened, the suitcase opens. 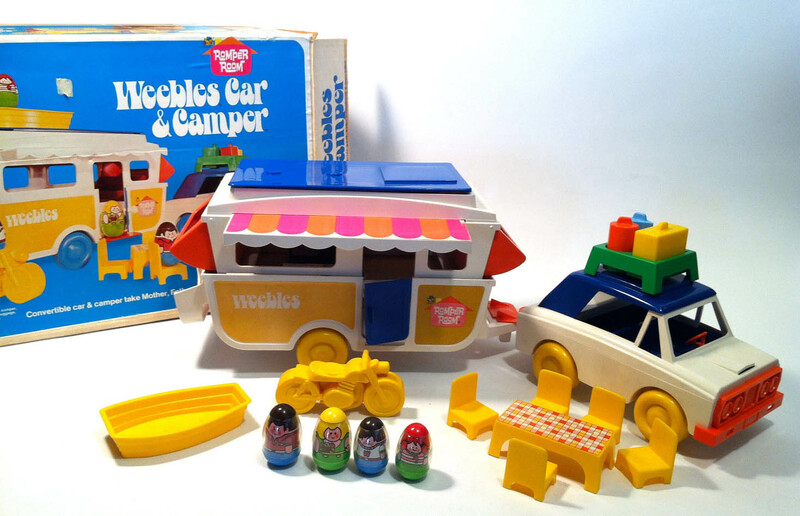 Inside the suitcase is marked, "©1973 Hasbro®, MADE IN USA". Description: Tall blue triangular (3-side) luggage with a molded handle on one end (triangular ends). Description: Tall green triangular (3-side) luggage with a molded handle on one end (triangular ends). Description: Tall red triangular (3-side) luggage with a molded handle on one end (triangular ends). Description: Tall yellow triangular (3-side) luggage with a molded handle on one end (triangular ends). Description: Tall round blue cylinder luggage with a molded handle on one end (round ends). Description: Tall round green cylinder luggage with a molded handle on one end (round ends). Description: Tall round red cylinder luggage with a molded handle on one end (round ends). Description: Tall round yellow cylinder luggage with a molded handle on one end (round ends).